Music: Regina Spektor, Far – her new album – it’s pretty friggin’ awesome if you haven’t had the chance to listen to it yet. Released on June 23, 2009. Menu: Pear, pecan, and gouda salad and a big slice of pizza! 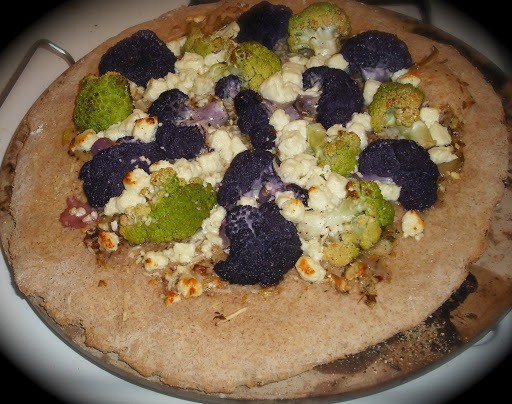 Purple cauliflower!!!! I know, crazy! 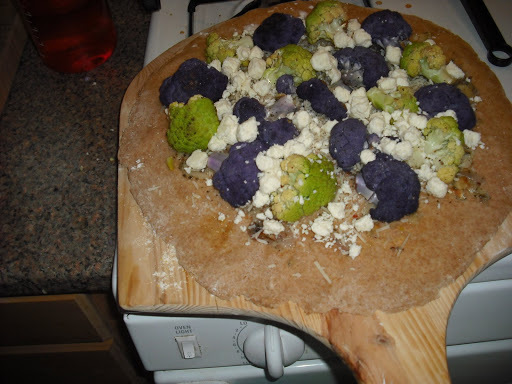 I couldn’t believe my eyes when I walked into the grocery store and saw green and purple cauliflower for $1.50/head; I know, crazy! Anyways, I had just run into the store to grab a few quick things, but I obviously could not resist these puppies. After much deliberation – au gratin, indian, roasted cauliflower pasta, the list goes on. BJ had the idea of a pizza. Perfect, I thought! So, I made a thick and hearty whole wheat dough. Roasted some garlic, shallots, and the cauliflower and added some feta. It was mighty tasty. Light and healthy, too! I just can’t get over that it was green and purple! 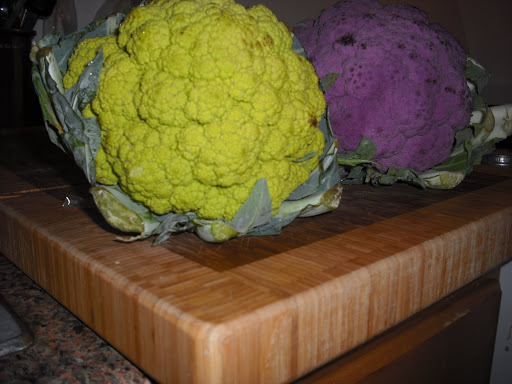 Okay, so what if you had these two lovely heads of colorful cauliflower, what would you make??? Drizzle garlic and shallot in EVOO. Wrap each in tin foil. Place on baking sheet. Toss cauliflower pieces with EVOO and S & P in a large bowl until pieces are coated. Place cauliflower on same baking sheet and roast in over for 12 minutes, flipping cauliflower once. Remove cauliflower and set aside. Continue roasting garlic and shallot for another 10 minutes. Remove garlic and shallot from oven and let cool. Place pizza stone in oven and reduce temperature to 375. Carefully remove garlic and shallot from foil. They should lightly browned and squishy. Chop the shallot. Remove each garlic clove by gently squeezing the head. Each clove should pop out easily. Sometimes you have to stick your finger or the tip of a fork to help move it along. 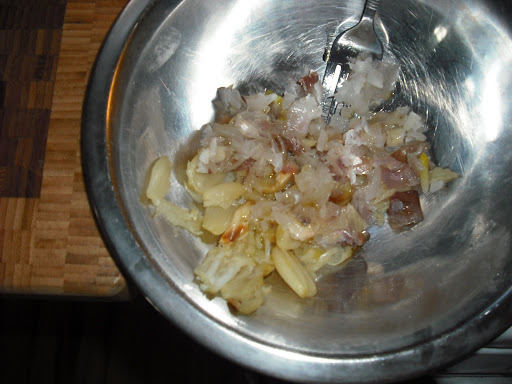 Place garlic cloves in a bowl and mash with a fork. Add the chopped shallot. Add S & P and thyme to garlic mixture. Slowly drizzle in EVOO until the mixture resembles a light sauce. Dust pizza peel with cornmeal. Place dough on top of cornmeal. Top with roasted garlic sauce. Then add cauliflower pieces. Lastly, sprinkle pizza with feta. Slide the pizza off the peel and onto the stone. Bake for 20 minutes, or until crust is browned on the bottom and feta is beginning to brown. Remove from oven and let cool for 5 minutes. Slice into pieces and serve!